The mine, operated by the private London-based company Lonmin, is one of the largest sources of platinum in the world, and yet many of the workforce live in shacks built on top of it. On Friday 10th August, 3,000 rock drillers took strike action demanding a wage increase to R12,5000 [1200 euro, or #960] a month. The strike took place in the context of increasing frustration at poor wages and dangerous working conditions, and also a growing anger at the role of the National Union of Mineworkers [NUM], the established union for mineworkers with close links to the tripartite alliance of the ANC, South African Communist Party [SACP] and Congress of South African Trade Unions [COSATU]. All also have a close relationship with the bosses at Lonmin. Former NUM leader and ANC executive committee member Cyril Ramaphosa is a non-executive director of the company. Many of the workers who began strike action last Friday sill belong to the NUM, but many have left that union in favour of the more militant Association of Mineworkers and Construction Union [AMCU]. NUM officials denounced the strike, but it nonetheless spread throughout the mine with thousands more joining the action. As the strike grew, there were clashes between strikers and the mine’s private security as well as workers who refused to support the strike. As the strike continued throughout the week, various spokespeople from the tripartite alliance did their utmost to demonise and criminalise the striking workers, and the independently-minded AMCU especially. 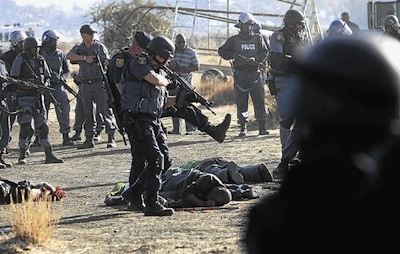 On 15th August Lonmin representatives withdrew from planned negotiations and the following day the South African Police Service were sent in to clear the strikers from a hilltop near the mine entrance and ultimately to break the strike. In the space of a few minutes the police had shot dead more than 30 workers, injured 80 more and arrested another 250. Almost as quickly, official propaganda began to spread that both sides has been engaged in a ‘gun battle’ and that police had only open fire in self-defence - something that will undoubtedly strike a chord with anyone aware of the history of British state violence in Ireland. In the aftermath of the massacre, the NUM, ANC, SACP and COSATU all accepted the police version of events. SACP spokespeople went a step further and called for the arrest of the leaders of the AMCU. The day after the massacre, Lonmin issued a threat to strikers that if they did not report to work the following Monday they would be fired. In the face of this ultimatum, the company could only claim that around a quarter of the workforce turned up this past Monday. Indeed, the demand for a pay increase that began at the Lonmin mine a fortnight ago has begun spreading to other mines in the region. Lonmin has backtracked on its threat and negotiations have begun, though the AMCU has claimed that mine management and the NUM are attempting to exclude it from the talks. The events in Marikana, in the run-up to and in the aftermath of the police massacre of striking workers, has once more exposed the deep schism that exists in South Africa between ruling elites and the working class. The richest ten percent of the population take 58 percent of the income, while the poorest ten percent make only 0.5 percent of the income. The bottom half of the population take only 8 percent. With unemployment standing at 6.8 million, one-third of the labour force, traditionally powerful unions such as the NUM have been bleeding members. That union, which once played a leading role in the struggle against apartheid, is now seen as being closely attached to the capitalist class and to the South African government, a government that has been firmly wedded to a neoliberal economic agenda since it first came to power in 1994. Many workers have joined upstart unions such as the AMCU that are not as shy about challenging the country’s ruling elites. The workers are turning toward unions they think will fight for jobs and for improved wages and working conditions. The growing resistance of the working class has taken other forms as well. In the past decade numerous mass social movements of the poor have come to life all over the country. Organisations such as the Abahlali baseMjondolo shack-dwellers’ movement, the Anti-Eviction Campaign and the Landless People’s Movement fight for decent social housing and health services for the poor, and they resist evictions and water and electricity cut-offs. Protests are a daily occurrence in South Africa, and so is state repression. The events in Marikana are a stark reminder of the likes of the Sharpeville massacre during the darkest days of apartheid. Working class organisations and trade union movements internationally must throw off its blinkers about the tripartite alliance. Whatever about its historical struggle against apartheid, the alliance now unabashedly upholds an economic apartheid under which millions of South Africans struggle to eke out an existence. The task now is to support these movements of workers and poor who dare to challenge the economic and political status quo. Amandla Ngawethu!